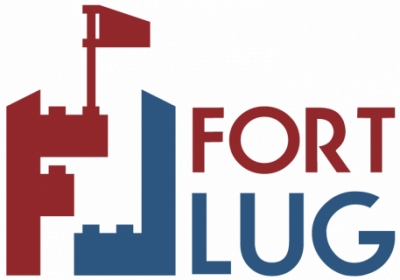 The FortLUG logo has received a redesign. After a few rough drafts were circulated and members voted at the August 19 meeting, the new logo was adopted. Designed by FortLUG member Caleb Fairres, the new logo resembles an actual LEGO fort, stylized with brick flair and a little flag on top! Check out the other cool things Caleb has made in the Member Pages section to the right. At the same time, FortLUG member Brandon C has been working with a friend to get the new logo printed on a batch of t-shirts the club has commissioned just in time for Brickworld Fort Wayne 2017. When you see one, you’ll know it’s us, so be on the lookout. Many thanks to Caleb and Brandon for their great work!